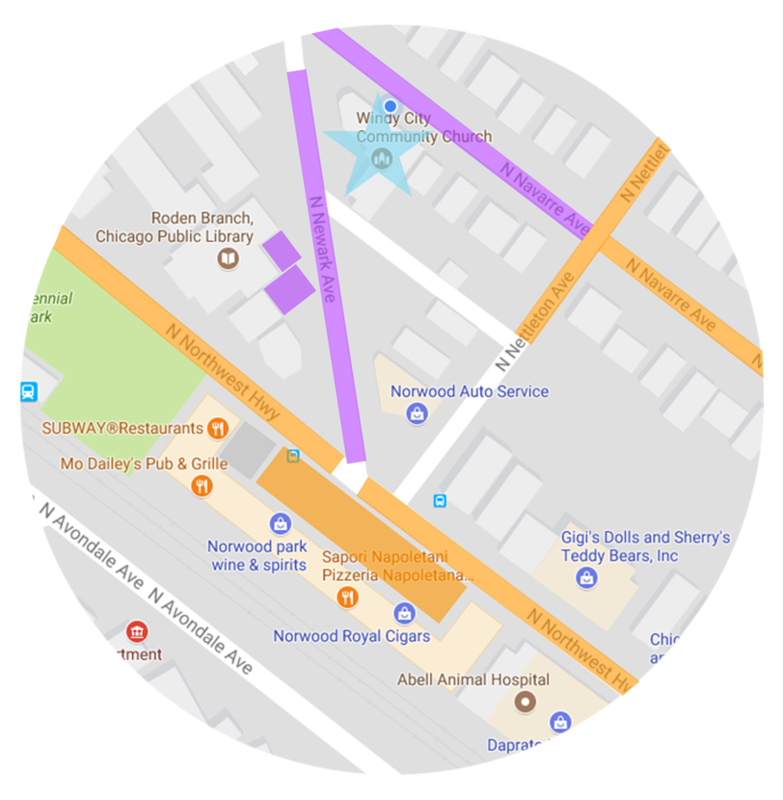 We're in Chicago's Norwood Park near Northwest Highway, between Harlem Ave. and Nagle Ave.
Click here to view Bus and Metra travel details. *Street parking: We have reserved the street parking closest to the church for new guests! You should easily find a parking spot on Newark or Navarre (the church entrance is at the triangle intersection of these two streets). *Lot parking: Dr. Kusz Dental Center parking lot and Roden Branch Public Library lot (both on Newark Ave) are available for new guest parking. *Look for street signs marking the handicap parking areas just in front of the church on both Newark and Navarre, near where the red dots are on the map. *Feel free to pull up near the triangle corner (at Newark & Navarre) to drop off your passengers before parking. On the map, it's the area just north of the blue star. *Street parking: Street parking on Nettleton, Northwest Highway, and Navarre is available. *Lot parking: 6060 Plaza parking lot (at 6060 Northwest Highway). All of these are within a short walking distance. Note: If parking at 6060 Plaza, please do not park in front of open businesses. There is plenty of parking near stores that are closed on Sundays. Thank you.